Cardamine bulbosa plant in flower. © Copyright Steve Baskauf, 2002-2011. discoverlife.org (Accessed 11/2017). 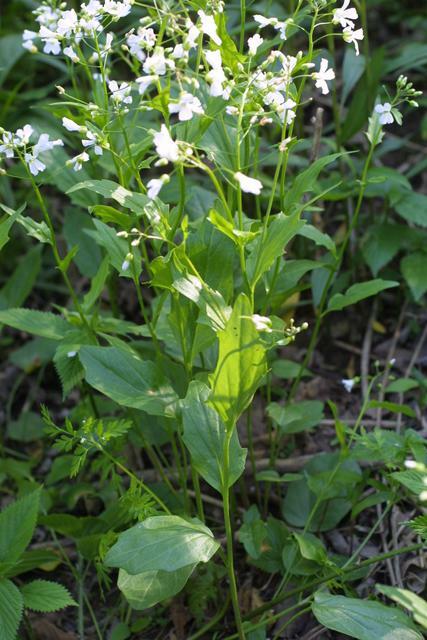 Cardamine bulbosa is an annual or perennial to 45 cm, elongating as flowers and fruit develop to 60 cm, stems 1 to a few, from a short, stout rhizome. Leaves alternate, simple, basal leaves round to heart-shaped about as wide as long, long-stalked, usually dying before plant flowers, stem leaves 4-8, rounded to narrow, the upper ones often stalkless. Flowers white, petals to 1.6 cm long, sepals turning yellow, blooming April-June. Fruit a dry, linear capsule, to 2.5 cm long, beak 0.4 cm, seeds oval. Habitat: Moist to wet woods, shallow water. Soil pH 5.0-6.8, found in soil pH 6.2 (Gargiullo unpublished data). Cardamine species are host to the larvae of the falcate orangetip butterfly, Anthocharis midea (Pieridae).